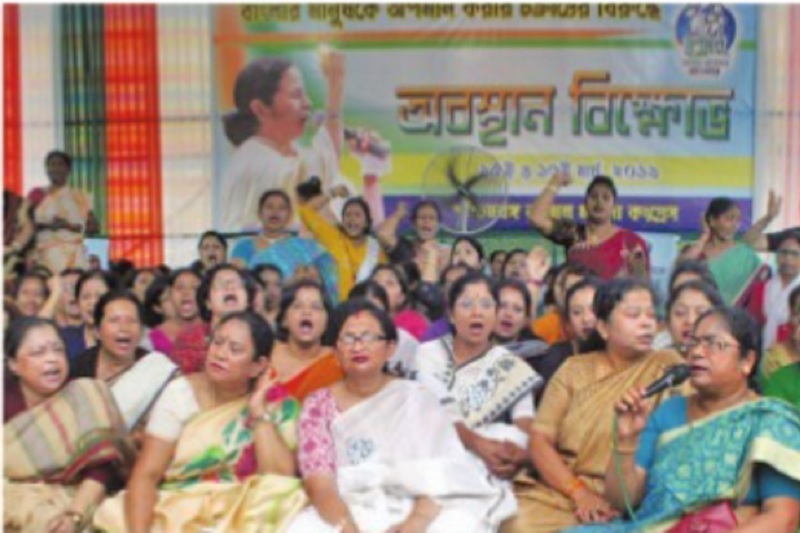 The Trinamul Congress’ women cell on Friday began a 48-hour sit-in demonstration at Rani Rashmoni Avenue to protest against the BJP’s central leadership’s effort to have 77,000 booths in the state declared “Super sensitive”. The Trinamul Congress’s fielding of its women cell led by the Minister of State for Health Chandrima Bhattacharya came on the heels of Chief Minister Mamata Banerjee making a blistering attack on the BJP claiming the party is out to tarnish the state’s image and trying to denigrate a peaceful state like Bengal. The BJP and its leaders are living in a fool’s paradise, she said. They can deploy one paramilitary jawan for every voter and “we will still win the elections”, Bhattacharya said. “The law and order situation is fine in Bengal. Despite this, the BJP is demanding that the state be declared super sensitive,” Bhattacharya said. “Is it not an insult to the people of West Bengal? We will protest against any attempt to malign our state,” Bhattacharya said. SUCI (C) on Friday took out a protest rally against issuing of new liquor licences by the state government. The rally started from Sealdah and reached the excise directorate in Bowbazar where the protesters demonstrated against the liquor policy of the state. They also demanded a complete ban on the sale of liquor and a crackdown on the sale of illegal and spurious liquor. A minor scuffle broke out when the party activists and protesters were stopped by police near Central Avenue. “In the past few years, the liquor shops have mushroomed across the state and sale of hooch has increased. While states like Bihar and Mizoram have banned the sale of liquor, the Bengal government has issued more new licences to liquor shops. It has destroyed many families and women are the worst sufferers,” said Subrata Gouri, Kolkata district secretary of SUCI, who led the protest march. He also added that SUCI (C) would continue the protests in all districts and strengthen the movement against illicit liquor. It is worth mentioning that the Supreme Court had earlier prohibited the sale of liquor within 500 metres of the national and state highways.